In your wedding photography business, there are many avenues you can take to reach and connect with clients. The various social media platforms available for wedding photographers makes building relationships with clients simpler than ever before. Facebook, in particular, is a social media platform which allows photographers to create a business page and feature relevant content with thousands of clients at once. Since a majority of photographers are on Facebook reaching clients who may be ideal for you, you need a way to stand out and encourage those clients to book you for their wedding day. One of the best ways to attract ideal clients to your Facebook page (and get them to move on to your website) is to feature a dynamic cover image design. The cover image on Facebook is one of the first things a client will see when accessing your business page. 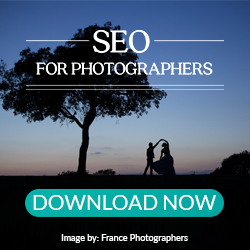 For you to grab the attention of clients who are perfect for you, your cover image should showcase who you are as a photographer and business owner. To give you inspiration on your design, we’ve put together 7 of our favorite Facebook cover images from photographers in the industry. When a client views your Facebook business page, their eye will first divert to your cover image design. If there is too much happening on your image, and it does not represent your brand, it could cause confusion for clients. After all, you are in control of the images they receive after the wedding day. Your cover image design tells clients what type of photos you enjoy creating, and what you will likely produce for them. The simpler and cleaner your cover image design is, the easier it is for clients to get an idea of your style. Related: Are you using the top 5 tips for Maximizing Facebook? Arizona photography duo, Amy and Jordan Demos, have a Facebook cover image design which is pleasing to the eye at first glance. It is not too distracting and allows clients to understand who they are as wedding photographers. As a wedding photographer, you have a unique style for the images you provide to clients. Clients who are ideal for you will be looking at examples of your work to see if you will match their wedding day vision. When your cover image design features images which represent your style, it can help clients get to know you and decide if you are right for them. Your unique style should attract your ideal clients and allow them to envision what their photos will look like if they work with you. Donal Doherty, a Fine Art Wedding Photographer from Northern Ireland, showcases his creativity and unique style on his Facebook cover image design. In addition to a few gorgeous photos from his past shoots, he has his logo on the cover image. This reinforces the fact he shot these images and that he has a style to help him stand out from other wedding photographers in the industry. In your business, the people who make it possible to do what you love are your clients. Two people looking for a wedding photographer to make their ideal wedding day images come to life hire you to do exactly what you are the best at. 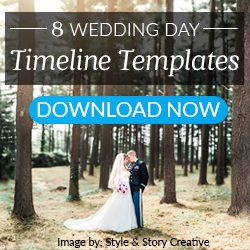 On your Facebook cover image design, it can be helpful to showcase some of your couples. 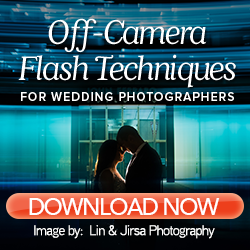 After all, the wedding day is about them and when you capture images of them together, it is important to showcase it. Related: How do you capture the candid moments of the wedding day? Colorado wedding photographers, Jason and Gina Grubb, have a cover image dedicated to the bride and groom. Their cover image design is simple, but shares an important detail about their couple. When clients view their Facebook business page, they can immediately see the connection the couple has, and what is important to them (since they featured their dog in the photo). Clients will also see the ability Jason and Gina have to capture such a special moment. Once you create your wedding photography business and decide what your specialty is, it is important to share that message to attract your ideal clients. This can help you focus on clients who will help your business grow in the future. Your Facebook cover image should showcase your specialty as a wedding photographer. Think about it as you would your website or portfolio. This could be the first touch a client has with you, so your cover image should let clients know what you prefer to shoot. Sarah Roshan, a specialist in shooting Romantic Mountain Weddings, has a Facebook cover image design focused on her specialty. As an outdoor wedding photographer, she chose an image of a couple in an outdoor location, with mountains in the background. This means that as soon as a client reaches her Facebook business page, they know exactly what type of photographer she is. Related: How can creating a strong and recognizable brand skyrocket your bookings? As you design your Facebook cover image, keep in mind the photo you include should be one of your top images. Though you shoot many photos throughout the wedding day, there are some which are considered “Wow” images. These are the best images of the wedding day, including candid and emotional images. Any image you share with your clients should represent the wedding day in a way that speaks to your style as a photographer. East Cost wedding photography duo, Justin and Mary Marantz, showcase a Facebook cover image design which features a “Wow” image from a past wedding. Even though they shot plenty of images for this wedding, they chose an image that best represents what they provide for clients. When an ideal client views Justin and Mary’s Facebook page, they will see that the couple shoots and shares the best images of the wedding day. Tip: When you place your logo or brand message on your cover image, make sure it is done in a way to not distract away from the photo you chose. When you present your portfolio to clients looking to hire a wedding photographer, you feature the best images from your past shoots. You also include images that tell the story of the wedding day, so clients can place themselves in the photos and imagine what they would look like. Key shots of the wedding day are important to include on your Facebook cover image design. These images can range from the kiss, to the first dance, and the couple’s exit to their honeymoon. Connecticut Wedding photographer, Eric Foley, has a Facebook cover image design which showcases the bride and groom leaving for their honeymoon. This is an image that many couples take on their wedding day, and it also captures an emotional moment. When ideal clients look at this cover image, they can envision their wedding day. Much of your client’s experience happens online, so it important to have a cover image to represent who you are as a wedding photographer and business owner. One way to easily do this is to design a Facebook cover image that is close to the design on your website. Use similar colors and backgrounds as you do on your website for your cover image design. This gives clients an enjoyable experience on each of your platforms, and means their expectations will be met when they finally reach your website. Virginia wedding photographer, Katelyn James, has a Facebook cover image design that matches her website and overall brand. The colors she uses are similar to her website, which creates an enjoyable experience for clients who visit both of her sites. Creating a Facebook business page with a dynamic cover image design can help you reach your ideal clients. Once you receive your images back from a photo editing company, include them into your Facebook cover image design so clients can view exactly what they will receive after booking you for the wedding day. Learn more about creating a Facebook business page your clients will love with our Facebook for the Wedding Photographer Guide!